Most of the work I do was developed by experimentation. Many of the techniques I use are fairly unique. I am self-taught in fiber and refuse to see lines of demarcation between fiber techniques, such as micro macrame, tatting and needle-lace for example. I will use any techniques in fiber that is useful to my designs regardless of its origin. The design determines the techniques, not the other way around. 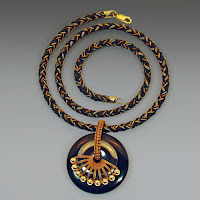 I go from what I call Zen designs with a little as 5 to 10 knots per piece to neckpieces with 300 to 500 knots per square inches with many hours of designing and execution. But believe it or not, the ones with fewer knots are often the hardest to design as it becomes a challenge to create a signature piece with so little, like a haiku it has to be distilled to its pure essence. In addition to art, design all around us and nature, my customers are my biggest sources of inspiration. After I design a piece and execute it, to see it worn on the person it is meant for, and by that I do not imply the perfect model, but a person to whom the piece has meaning. It is such a treat; it is like finally this orphan, the piece I created, has found its rightful home, or emotionally it feels like it. And as to inspiration, the body of work already done is also a great source as each piece already done creates new possibilities. I am always fascinated by successful artisans who are self-taught. How did you teach yourself these fiber and textile techniques? It all started when I went to the Southwest with my husband to be, a painter. He would stop in the middle of the desert, sketch and paint for hours, so to relieve my boredom after searching the desert floor for geodes, I taught myself how to knot from a small book I had picked up at the San Francisco Museum of Modern Art. He happened to have some waxed linen, then I found some local seeds that could be turned into beads with a hammer and nail to make the holes. I studied silversmithing after that and it completely changed my approach to jewelry designing with fiber and textile techniques. When I studied metalsmithing, my instructor told me that the result, the finished piece was not enough to justify the process. I realized later on what he meant. In order to be able to work in our field, handmade work, one needs to be passionate about the process, the actual work one does every day, to create a body of work. It is the real connection with the work, day in and day out. So even though I liked the result of my work with metals, I felt drawn to fiber, connected to thread, and the processes involving thread. Marion grew up in Switzerland and now lives San Carlos, CA, just outside of San Francisco. When I grew up in Switzerland, my father exposed us to art and architecture and helped us develop a sense of design. He was an architect. My husband, a painter, taught me to see and experience nature. Together we learned a lot about colors. Anywhere I go now I see art, color and design, and appreciate the beauty that surrounds us. Seeing design and beauty and taking the few seconds it takes to truly see them nourishes the soul. I find this to be a great source of energy. As a designer I see myself as a combination of Swiss and European roots with limbs and leaves exposed to the California sun and wind. And California being on the Pacific rim has also more Eastern influences. When I came to California, I really got a sense of freedom and possibilities. Risk taking is part of the reality here. So I was able to experiment in ways not quite possible in Switzerland. I still often feel like I am playing as a kid and wonder what I will do when I grow up, just kidding… though that thought often passes through my head. For many years I sold most of my work wholesale, so I was working in my studio, alone, days at a time. My only contact was with the UPS driver and the checks in the mail 30 days later. That was in the golden days for crafts wholesale. Later on when the business model for buyers of handmade crafts changed, requiring us the makers to jump through too many hoops for wholesale, I returned to doing mostly craft shows. I find a lot of satisfaction in the direct interaction with customers. I like setting up a show, creating my own unique temporary retail space for a weekend. I have now lots of repeat customers, some just come by to say hi and to tell me how much they enjoy the pieces they already own, or to see my newest designs. Of course I get affected by the way people react to my work, though I work in an areas of design with techniques that have not always been very popular. It is really a very small niche and fiber and textile arts, since traditionally a women’s occupation, tend to be under-appreciated and undervalued. A friend got me involved in teaching my fiber techniques for jewelry. I realized at that time that a lot of my work was unique and if I was not willing to teach it, it would be lost. My first classes were completely unrealistic, I thought everyone would learn very quickly and had no understanding of the learning curve of the techniques I taught. I had to come up with better teaching methods and sometimes better techniques altogether. Teaching forced me to refine my work. And students have actually taught me so much over the years. How do you balance the creative side of the business with the “business” of the business? That’s always a challenge, and it took me a long time to understand that the business side also needed some creativity and attention. It took me forever to understand the principle of a ‘bread and butter’ items for example, items that can be purchased easily by customers, like bread and butter, because they are not too expensive compared to their perceived value. Nowadays I divide my time also with my online store. It opened in January 2006. It got its start on a whim with supplies, nylon thread and a few jewelry kits. I thought it would be mainly for my students who could not find thread. To my amazement the store grew, literally overnight… In 2002 I had gone back to school to learn web design. I took one full semester class per semester, designed my artist website, my husband’s, had fun one semester with flash animation… I also like the challenge of designing a beautiful website that works. Here is the advice I still give myself all the time: whatever I do, do it to my best ability, create with passion, make sure many of the pieces I create are affordable, exhibit them with care and be ready to pass them along to their future owners, my customers. Creating ‘objects d’art’ is such a luxury and joy, it is nice to share it with others. And if one is able to make a living at it, it really is a form of grace. Ah! A form of grace. How lovely that sounds! Next post: Jennie Lorette Keatts: Turning Mud Into Gemstones!